BROWN (US) — Scientists have pinpointed the brainwave frequencies and brain region associated with sleep-enhanced learning of a finger-tapping task akin to typing or playing piano. “The mechanisms of memory consolidations regarding motor memory learning were still uncertain until now,” says Masako Tamaki, a postdoctoral researcher at Brown University and lead author of the study appearing today in the Journal of Neuroscience. “We were trying to figure out which part of the brain is doing what during sleep, independent of what goes on during wakefulness. We were trying to figure out the specific role of sleep,” says Tamaki. Specifically, the results of complex experiments performed at Massachusetts General Hospital and then analyzed at Brown show that the improved speed and accuracy volunteers showed on the task after a few hours sleep was significantly associated with changes in fast-sigma and delta brainwave oscillations in their supplementary motor area (SMA), a region on the top-middle of the brain. These specific brainwave changes in the SMA occurred during a particular phase of sleep known as “slow-wave” sleep. Scientists have shown that sleep improves many kinds of learning, including the kind of sequential finger-tapping motor tasks addressed in the study, but they haven’t been sure about why or how. It’s an intensive activity for the brain to consolidate learning and so the brain may benefit from sleep perhaps because more energy is available or because distractions and new inputs are fewer, says corresponding author Yuka Sasaki, a research associate professor in the department of cognitive, linguistic & psychological sciences. 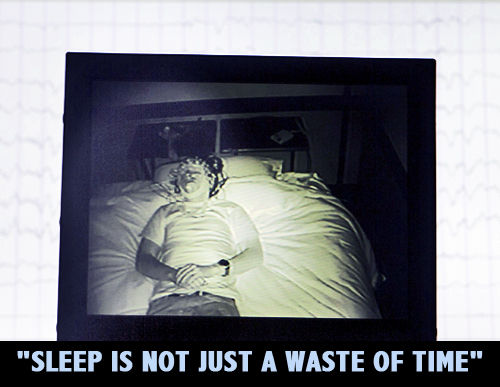 “Sleep is not just a waste of time,” Sasaki says. The extent of reorganization that the brain accomplishes during sleep is suggested by the distinct roles the two brainwave oscillations appear to play. The authors write that the delta oscillations appeared to govern the changes in the SMA’s connectivity with other areas of the cortex, while the fast-sigma oscillations appeared to pertain to changes within the SMA itself. To make their findings, Sasaki, Tamaki, and their team asked each of their 15 subjects to volunteer for the motor learning experiments. For the first three nights, nine subjects simply slept at whatever their preferred bedtime was while their brains were scanned both with magnetoencephalography (MEG), which measures the oscillations with precise timing, and polysomnography, which keeps track of sleep phase. By this time the researchers had good baseline measurements of their brain activity and subjects had become accustomed to sleeping in the lab. On day four, the subjects learned the finger-tapping task on their non-dominant hand (to purposely make it harder to learn). The subjects were then allowed to go to sleep for three hours and were again scanned with PSG and MEG. Then the researchers woke them up. An hour later they asked the subjects to perform the tapping task. As a control, six other subjects did not sleep after learning the task, but were also asked to perform it four hours after being trained. Those who slept did the task faster and more accurately than those who did not. On day five, the researchers scanned each volunteer with an magnetic resonance imaging machine, which maps brain anatomy, so that they could later see where the MEG oscillations they had observed were located in each subject’s brain. In all, the experimenters tracked five different oscillation frequencies in eight brain regions (four distinct regions on each of the brain’s two sides). Sasaki says she expected the most significant activity to take place in the “M1” brain region, which governs motor control, but instead the significant changes occurred in the SMA on the opposite side of the trained hand. What was especially important about the delta and fast-sigma oscillations was that they fit two key criteria with statistical significance: they changed substantially after subjects were trained in the task and the strength of that change correlated with the degree of the subject’s performance improvement on the task. After performing the experiments, the team of Sasaki, Tamaki, and co-author Takeo Watanabe moved from MGH to Brown, where they have set up a new sleep lab. They have since begun a project to further study how the brain consolidates learning. In this case they’re looking at visual learning tasks. In addition to Tamaki, Sasaki, and Watanabe, other authors on the paper contributed from Boston University, MGH, National Taiwan University, and Arizona State University. The National Institutes of Health and the National Science Foundation supported the research. Data analysis at Brown took place using the computing resources of the Center for Computation and Visualization.